Collaboration among case workers and managers is key to a successful case management implementation. To help support that effort, user forms contain a Related Cases tab ( ) that enable case workers to see a list of all cases related to the same customer within the application. The system identifies a customer by his or her email address and populates the list with cases having the same address. When a worker clicks an item on the list, the case opens in its review form. So that workers can add the customer to the case, the case type must reference a work party rule that includes the Customer role. This article describes how to to add the role to the the work party rule using the Case Designer and case type rule. Note: The standard Default and pyCaseManagerDefault work party rules include the Customer role. In the following sample insurance application, a case worker creates an audit case and another worker creates an underwrite case when a customer applies for a policy. Both the audit and underwrite case workers should be able to view each other's case as they process their work. Currently, the case type uses a work parties rule in which the Customer role is not defined. When the case worker displays a case, the tab displays the message "No customer party defined on this case." Open the Case Designer ( > Process & Rules > Case Management > Case Designer ). Select Audit on the Case Types tree, and select the Actions > Open menu to open the case type rule. On the Case Type rule form's the Processes tab, open the work parties rule by selecting the pencil icon ( ). Note that there is no Customer role. Add a row ( ) and enter the Customer role values as shown here. Note: Make sure that all case types in the application reference a work parties rule that contains a Customer role. Open the Case Manager portal and create an audit case from the New menu. 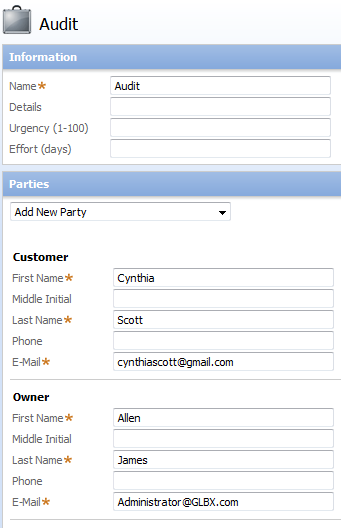 In the New form, add a Customer in the Add New Party drop-down list and enter the First Name, Last Name, and E-Mail information. In the new case's Perform user form (C-97), open the Parties tab ( ) to view the customer information. For a technical view, go to the Designer Studio and open the Clipboard tool. From the Thread Menu select the Thread for this case. On PyWorkPage, note the pyCustomer and pyCustomerName values. 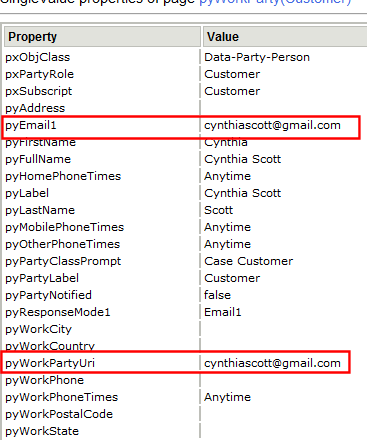 On the pyWorkParty(Customer)(Data-Party-Person)embedded page, note that pyEmail1 address is recorded in the standard property pyWorkPartyUri. This is the value the system uses to identify the customer and populate the Related Cases list. Return to the Case Worker portal and create an underwrite case from the New menu. Enter the same customer information (note that the email address is case sensitive). Open the Related Cases tab ( ), which contains a link to the related audit case C-97. Click the Audit link to open the case's Review form. Select the Related Cases tab, which contains the underwrite case C-98. You can click the Underwrite link to open C-97's Review form.